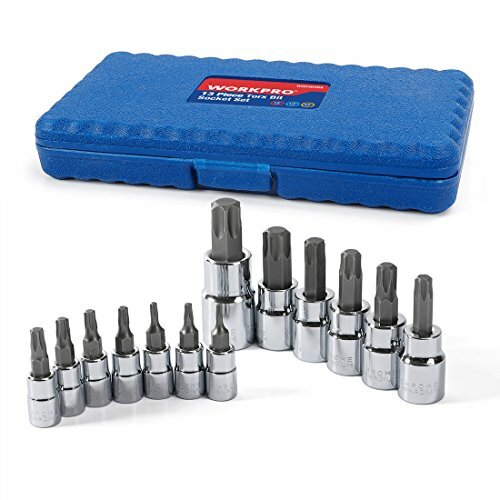 The WORKPRO 13-piece bit socket set features chrome vanadium steel forged socket and S2 steel forged bits for torque, strength, and durability. All tools within this set meet or exceed all ANSI specifications for added safety. All pieces of this set fit securely within a durable blow-molded carry case for easy organization and convenient portability. Drop-forged, heat-treated S2 steel bit for torque, strength, and durability. 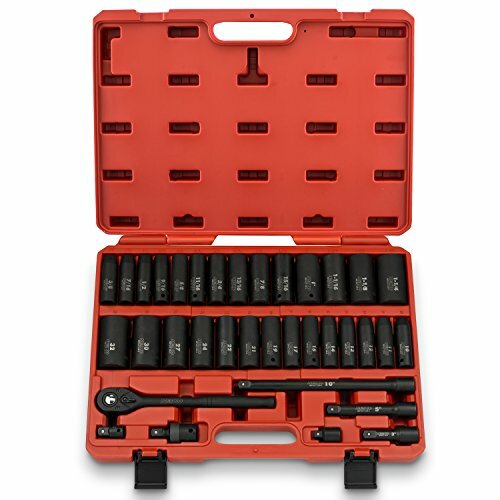 With both SAE and Metric sizes, this 52 Piece Socket Set is perfect for mechanics, craftsmen and home owners alike. 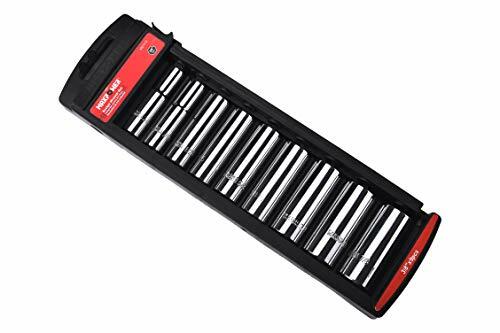 This tool set offers a broad assortment of common sized sockets to fit almost any job you need to tackle. The set includes two ratchet drivers, two spark plug sockets, extensions and a spinner handle. All of these tools are drop forged steel with a Chrome Vanadium finish for durability and protection from corrosion. The convenient carrying case opens flat for easy tool retrieval and organization on the job. 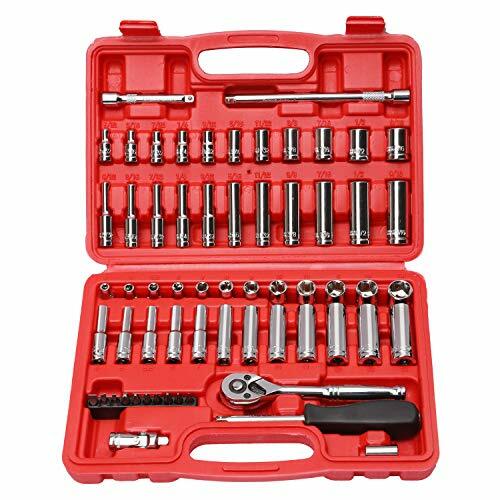 Includes: 8.5" (1/2" Head) Ratchet and 7.25" (3/8" Head"); 1/4 Drive Spinner Handle; 3/8 Drive 5/8 (16 mm) Spark Plug Socket; 3/8 Drive 13/16 (21 mm) Spark Plug Socket; Extension Bar 3/8" Drive 70mm; 1/4 Sockets (Metric): 4, 4.5, 5, 5.5, 6, 7, 8, 9, 10, 11, 12, 13 mm; 3/8 Sockets (Metric): 14, 16, 17 mm; Bit Adaptor 3/8" to 1/4"; 1/2 Sockets (Metric): 10, 11, 12, 14, 15, 16, 18, 19, 20, 22 mm; 3/8 Sockets (SAE): 9/16, 11/18, 3/4"; 1/4 Sockets (8 Point)SAE)): 1/4, 5/19, 3/8"; 1/4" Sockets (SAE): 1/2, 15/32, 7/16, 3/32, 3/8, 11/32, 5/16, 9/32, 1/4, 7/32, 3/16, 5/32"; Spin Disk 3/8" Drive; Sturdy Blow Molded Polypropylene Case. 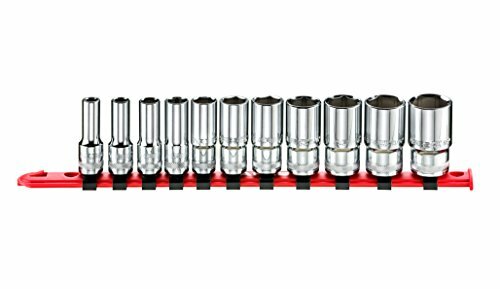 Neiko 3/8 and 1/2-Inch Drive Complete Duo metric Combination Impact Socket Set. Heavy duty construction. All metric sockets include a standard equivalent marked on the socket. S2 alloy steel bits + chrome vanadium steel sockets contribute to solid construction, withstand greater strength, ensure longer service life. Sand blasting finish provides maximum protection from rust and corrosion . All sockets are neatly organized and protected in a sturdy plastic case. 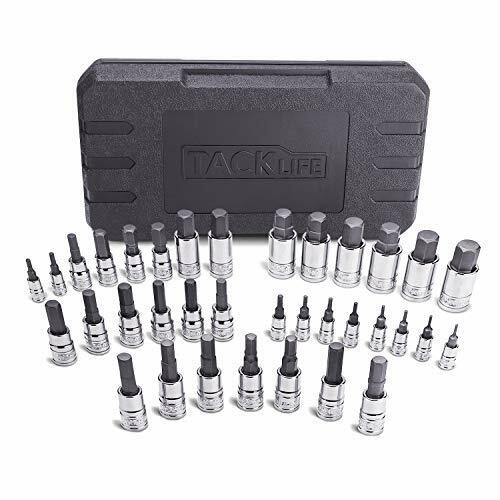 TACKLIFE offers 24-month satisfaction guarantee. If you have any questions, please contact us: support@tacklife.net. 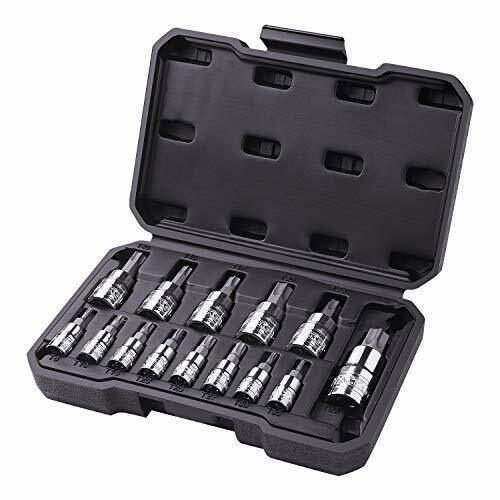 This CASOMAN 13-Piece Metric hex bit socket Set Include: 1/4" Drive: 2mm, 2.5mm, 3mm, 4mm, 5mm, 5.5mm, 6mm; 3/8" Drive: 7mm, 8mm, 9mm, 10mm, 12mm; 1/2" Drive: 14mm. The Bits made of premium S2 alloy steel for superior hardness that reduce wear-outs and insure longevity,Cr-V steel sockets provide superior torque for greater turning power with mirror chrome finish for corrosion resistance. All CASOMAN Sockets meets or exceeds ANSI performance standards and comes with 1 year quality warranty. Bits made of premium S2 alloy steel for superior hardness and insure longevity,Cr-V steel sockets provide superior torque for greater turning power. Sockets features a chrome finish and bits are made from S2 steel bits to resist rust and corrosion. It comes with a durable blow-molded carrying case for easy transportation, safe storage, and quick organization. Meets or exceeds ANSI performance standards. It comes with 1 year quality warranty. 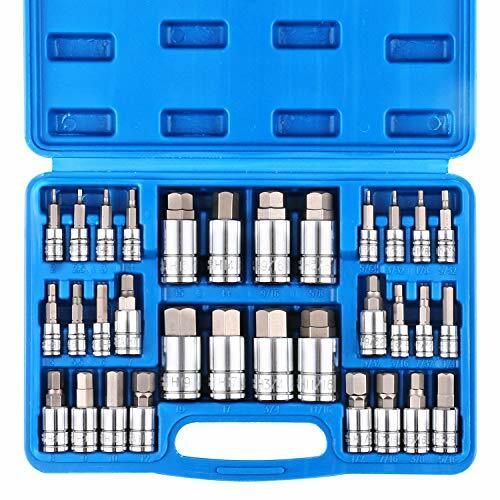 This CASOMAN 32 Piece Master Hex Bit Socket Set include 16-Piece Metric hex bit sockets (1/4" Drive: 2mm, 2.5mm, 3mm, 4mm, 5mm, 5.5mm, 6mm; 3/8" Drive: 7mm, 8mm, 9mm, 10mm, 12mm; 1/2" Drive: 14mm, 15mm, 17mm, 19mm) & 16-Piece SAE hex bit sockets. (Size:1/4" Drive: 5/64", 3/32", 1/8", 5/32", 3/16", 7/32", 1/4"; 3/8" Drive: 9/32", 5/16", 3/8", 7/16", 1/2"; 1/2" Drive: 9/16", 5/8", 11/16", 3/4") It constructed from S2 Steel and chrome vanadium steel (CR-V) for superior strength and longevity, Sockets features a chrome finish and bits are made from S2 steel bits to resist rust and corrosion. All CASOMAN Sockets meets or exceeds ANSI performance standards and comes with 1 year quality warranty. 1/2" Drive: 9/16", 5/8", 11/16", 3/4"
This CASOMAN 3/8" and 1/2" Drive Impact Socket Set efficiently transfer torque from impact wrench to fastener, loosening the most stubborn nuts and bolts. It built for using with impact tools. Our impact sockets made from high-strength chrome vanadium steel, Corrosion-resistant black electroplate finish, resulting in a longer useable life. CASOMAN impact sockets meet or exceed ANSI performance standards. An extra-deep broach in the deep sockets enables you to access the entire length of fasteners. Even in low light, the high-contrast, permanent laser etched size markings are easy-to-read. The customized durable case can be stored in a tool chest or carried to your job site. Molded size markings keeps set organized and identifies any missing. (10) Pieces 1/2" Dr. Deep Sockets (inch): 1/2", 9/16", 11/16", 3/4", 13/16", 7/8", 1", 1-1/16", 1-1/8", 1-1/4"
(11) Pieces 1/2" Dr. Shallow Sockets (metric): 10-11-12-13-14-15-16-17-18-21-24mm. (6) Pieces 3/8" Dr. 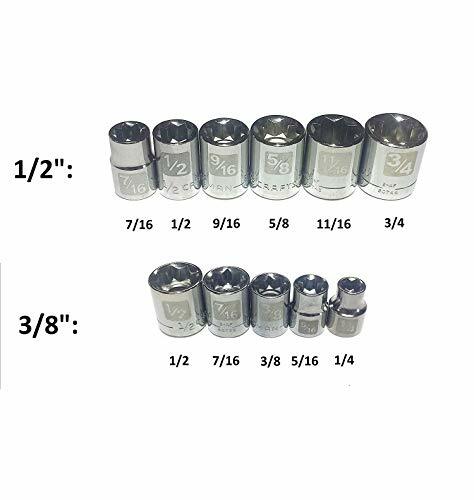 Shallow Sockets (inch): 3/8", 7/16", 1/2", 9/16", 11/16", 3/4"
All sockets and accessories are manufactured from cold formed Chrome Vanadium alloy steel and heat treated for outstanding strength, Corrosion-resistant black electroplate finish, providing the durability for a hard use. Special 6-point flank drive design turns the flat sides of fasteners and delivers maximum torque, while not stripping and damaging the corners. 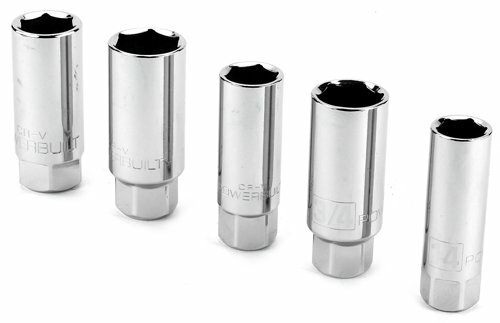 A unique combination of both SAE & Metric sizes and Deep & Shallow length, Complete 3/8 and 1/2 Drive Impact Socket Set. Comes in a customized heavy duty case with molded size index for easy and organized storage. The ARES Impact Extension and Socket Adapter Set allows you to use the drivers you already have, saving you the trouble and expense of having to buy new sets of tools. With three 3-inch extensions, two adapters, and two reducers, this set includes everything you need to get the most out of your impact tools. The extensions are made from heat-treated Chrome Vanadium steel with a Black Oxide coating, and the adapters and reducers are made from high-strength, premium Chrome Moly steel with a corrosion-resistant Manganese Phosphate coating, so you know this set is made to last. With spring-loaded detent balls to securely latch sockets and through-holes in the drive ends of the adapters and reducers to lock onto the drive tang, you can be confident in the perfect fit. SET INCLUDES: This impact extension and adapter set includes three 1/4-inch hex shank 3-inch extensions in 1/4-inch, 3/8-inch, and 1/2-inch drive sizes, two adapters in 1/4-inch (F) to 3/8-inch (M) and 3/8-inch (F) to 1/2-inch (M) sizes, and two reducers in 3/8-inch drive (F) to 1/4-inch drive (M) and 1/2-inch drive (F) to 3/8-inch drive (M) sizes. DESIGN CONSIDERATIONS: These extensions, adapters, and reducers are designed for Impact use and feature spring-loaded detent balls to securely latch sockets, while the through-holes in the drive end of the adapters and reducers lock onto the drive tang. The sizes are even laser etched onto the adapters and reducers for easy identification. This handy set will ensure you'll always have the right size for the job and get the most out of your impact tools. QUALITY MATERIALS: The 3-inch extensions in this set are made of heat treated Chrome Vanadium steel with a Black Oxide coating, and the adapters and reducers are made from high-strength, premium Chrome Moly Steel with a Manganese Phosphate coating to help resist rust and corrosion and ensure a life time of use. These tools meet and exceed ANSI/ASME standards. RELIABLE | EFFECTIVE | EFFICIENT: Users trust ARES to be quality tools. You are backed by our Performance Assurance Limited Lifetime Warranty. If you have any issues with your ARES Impact Extension and Socket Adapter Set, simply contact customer service for troubleshooting help, parts, replacement, or refund. 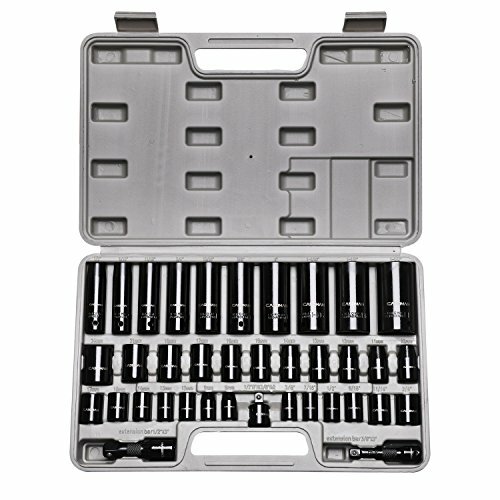 This CASOMAN 62 Pieces 1/4-Inch Drive Master Socket Set include 24pcs 1/4"Dr. Shallow and Deep Socket (Metric) from 4-14mm, and 22pcs 1/4" Dr. 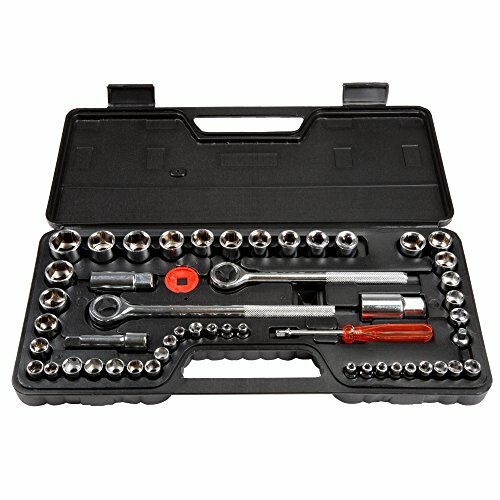 Shallow and Deep Socket (inch) from 5/32-Inch - 9/16-Inch, 1/4" 72 fine-tooth ratchet, Adapters, 3"& 6" Extensions and 1/4" Dr. Bits Set, 1/4"Dr. universal joint, 1/4"Dr. Coupler, 1/4" spinner handle. And all the tools are manufactured from cold formed premium quality Chrome Vanadium alloy steel and heat treated for outstanding strength and corrosive resistance; providing the durability for a hard use.All CASOMAN Sockets meets or exceeds ANSI performance standards and comes with 1 year quality warranty. 2PCS--1/4" Dr. EXTENSION BAR: 3" & 6"
10PCS--1/4'' Dr. Bits: SL3, 4, 6 .PH0, 1, 2. PZ0, 1, 2, 3. 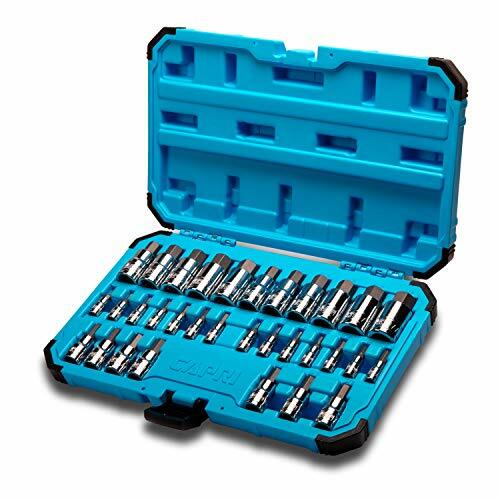 This 1/4 Socekt Set Includes 46 pcs sockets in SAE and metric, deep and shallow, from 4mm to 14mm, 5/32-Inch - 9/16-Inch, 6 points, high torque, Cr-V sockets. At Tacklife, we aim to manufacture the best products that inspire our consumers to live a more convenient, secure lifestyle. All sockets are neatly stored in a sturdy plastic case, easy storage. Maxpower is one of the world's largest hand tool manufacturer. -- Our 6PT SOCKETS are constructed from premium Heat Treated Chrome Vanadium Steel and feature a corrosion resistant mirror polish finish. -- 9 Piece 3/8-inch drive deep socket set includes: 3/8", 7/16", 1/2", 9/16", 5/8", 11/16", 3/4", 13/16", 7/8". -- This set come with a closed socket rack, so you'll never have to go looking for a misplaced socket again. Warranty: Maxpower offers 2 Years warranty against any manufacturer defects. 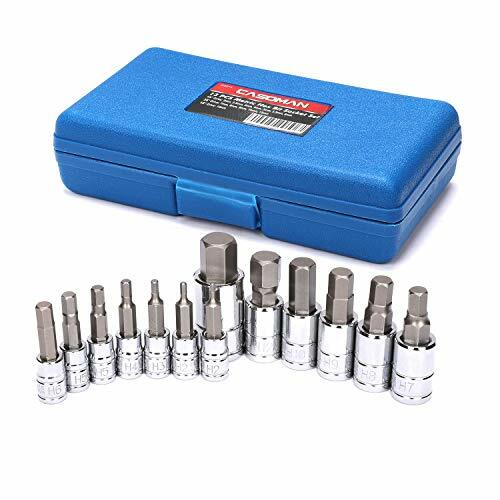 Set include: 9 Pieces 3/8-inch drive Deep SAE sockets, 3/8", 7/16", 1/2", 9/16", 5/8", 11/16", 3/4", 13/16", 7/8"
Brand: MAXPOWER | Manufacturer: Weihai Maxpower Tools Co., Ltd. 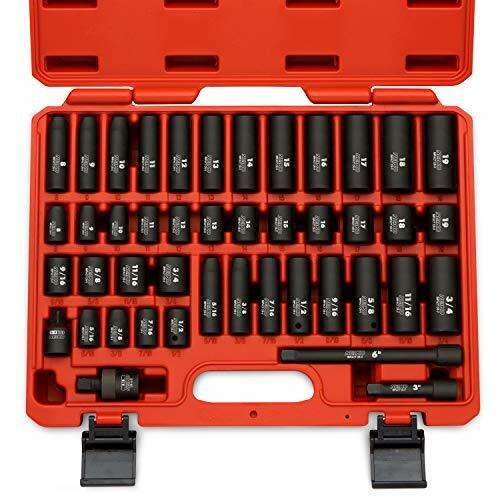 Grab the Right Size with the Easy Read Socket Set Whether you're getting up there in years, or just spend a lot of time working in dim conditions, this easy read socket set features clear laser etched size markings that make finding the size you need fast and easy. The same quality build you've come to expect from Craftsman, each socket is built from high tensile strength steel and machined to fit fasteners tight. 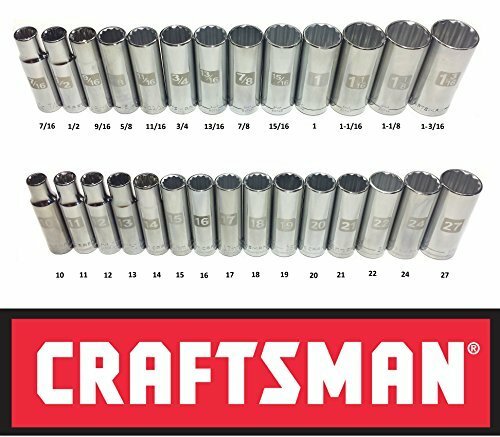 A solid addition to any kit, this easy read socket set features a smooth polished finish that wipes clean after even the dirtiest jobs, Built tough, they're backed by the power of the Craftsman Forever Guarantee, so you'll get decades of solid service, you can count on. 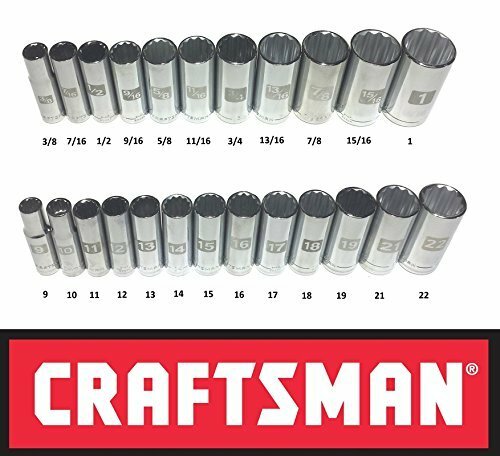 Load up your tool box with this socket set, and grab the right size the first time.Craftsman Stopped Manufacturing Most of the Tools in USA so this Item do not come with the Made in USA Stamp.Comes in Clear Sealed Bag. Craftsman Stopped Manufacturing Most of the Tools in USA so this Item do not come with the Made in USA Stamp. Backed by the Craftsman Lifetime Warranty. Comes in Clear Sealed Bag. 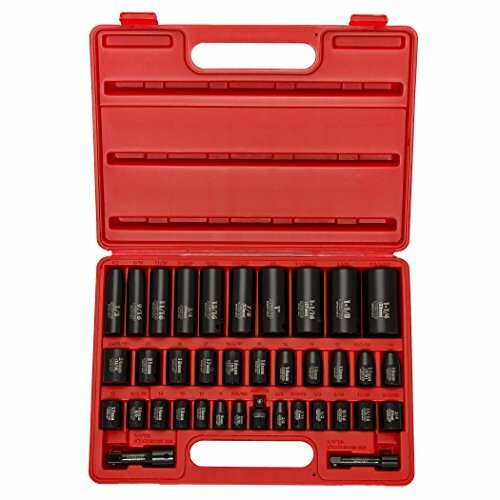 This Capri Tools master Hex bit socket set comes complete with 32 pieces of the most popular Hex bits. Each piece is made with tough S2 steel alloy to ensure durability and strength with a chrome polish to provide maximum oil and corrosion resistance. Both SAE and metric sizes are included. This set comes with a convenient blow-molded storage box for portability and protection. These are perfect for use with breaker bars, torque wrenches and ratchets (not for use with impact tools). This set meets and exceeds ANSI standards and comes with a lifetime replacement guarantee. 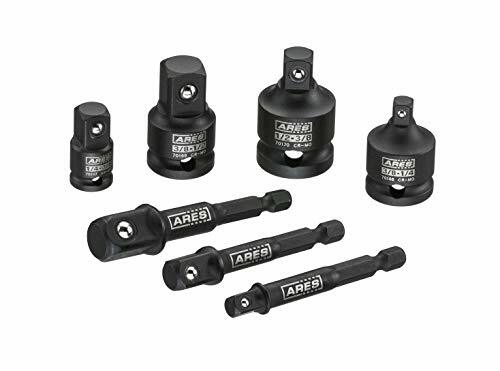 This ARES SAE Mid Length Socket Set provides you with eleven mid length SAE sockets with a length of 1.96 inches so you'll have the enhanced clearance you need for tight spots. Made of heat treated Chrome Vanadium steel, these sockets also feature a mirror polish finish to prevent corrosion, and thanks to the included high quality storage rail, you'll never have to go looking for the socket you need. 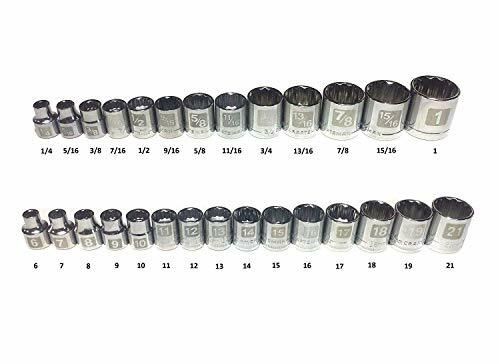 SET INCLUDES: This 11-piece set includes the following socket sizes: 1/4-inch, 5/16-inch, 3/8-inch, 7/16-inch, 1/2-inch, 9/16-inch, 5/8-inch, 11/16-inch, 3/4-inch, 13/16-inch and 7/8-inch. You also get a high quality socket organizer for storage. DESIGN CONSIDERATIONS: Our 6-Point Mid Length Sockets are constructed from premium Heat Treated Chrome Vanadium Steel and feature a corrosion resistant mirror polish finish while the mid length socket design allows for enhanced clearance in tight spots. The sockets are 1.96 inches in length. CONVENIENT STORAGE: This set comes complete with a high quality socket holder, so you'll never have to go looking for a misplaced socket again! RELIABLE | EFFECTIVE | EFFICIENT: Users trust ARES to be quality tools. You are backed by our Performance Assurance Limited Lifetime Warranty. If you have any issues with your ARES Mid Length Socket Set, simply contact customer service for troubleshooting help, parts, replacement, or refund.